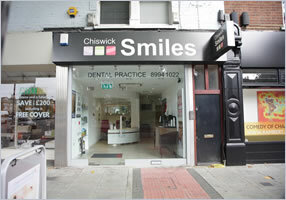 The practice is conveniently located on Chiswick High Road within easy walking distance of both Turnham Green and Stamford Brook tube stations (zone 2). Bus routes within two minute walk are 190,267,391,27,237 and H91. 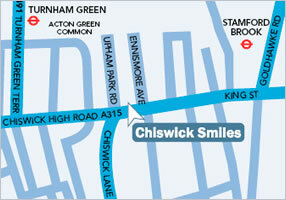 We also offer limited FREE PARKING – this must be arranged at the time of booking your appointment. Our facilities are all on street level and we have full disabled accessibility. Payments are made on the day of treatment. A deposit will be required for all specialist appointments or any general appointment over 45 minutes. We require 48 hours notice to re-schedule or cancel an appointment – a fee may be charged for failed or late cancellation of appointments. If you have a dental emergency and are in need of treatment outside of surgery hours, we do provide a NO EXTRA CHARGE call out service. The fee payable for the consultation at this time is £60. Non registered patients are welcome to use this facility .